édité le 04/02/2014 - Plus de news de "CHEVRON" - Voir la fiche entreprise de "CHEVRON"
Chevron Energy Technology Company and GE Oil & Gas announced today the creation of the Chevron GE Technology Alliance, which will develop and commercialize valuable technologies to solve critical needs for the oil and gas industry. 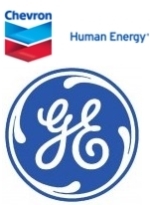 GE Oil & Gas works on the things that matter in the oil and gas industry. In collaboration with our customers, we push the boundaries of technology to bring energy to the world. From extraction to transportation to end use, we address today's toughest challenges in order to fuel the future.